This is my 3rd time making this wine. To me, its so precious that I don't give this away to anyone! except to my mother and my mother-in-law. Reason being, its so deliciously good. Much better than Hong Zhao or Bai Mi jiu in flavour and taste. I don't have a picture of the final brown rice wine..will update this post next week when the wine has settled, filtered. 1. 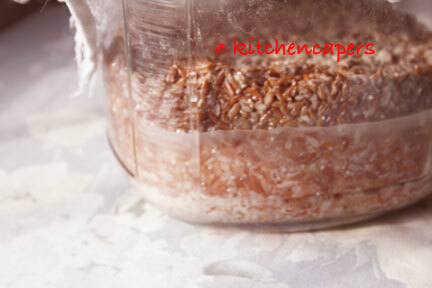 Wash and cook rice in a rice cooker. Amount of water to be added will be the same with any type of rice that is cooked in a rice cooker. 2. Wait for it to cool completely before using. Usually takes half a day. I usually had an electric fan blowing at it . It cools faster this way. 3. pound the wine yeast till powdery and mix with the sugar. 4. When rice is cooled, wear surgical rubber gloves and mix the yeast and rice together. 5. Put the rice in a glass container and roll up your fist and pound/push down the rice to the bottom of the jar. 6. Cover with a cloth, then followed by the cover. 7. Leave it to stand for 30 days*. 8. After 30 days, harvest the wine and pour into a glass bottle to leave to settle again. The wine should look like diluted milo drink! Do not throw away the rice residue. It is still grainy. So usually what I do is to run it thru a blender. And I use it to cook like I would with the Hong Zhao rice dregs too. After 2 rounds of experimentation, I find that the taste is more intense and flavourful than the normal 21 days cycle. Sugar was added this time round..to help to activate the wine production. The wine is not sweet. I have the brown rice wine today. 1) Do I need to stir it in 7 days? no need to stir, just leave it alone till its ready to harvest. Thanks for your advise. Once harvest, I'll take picture to show (if the wine making are successful). 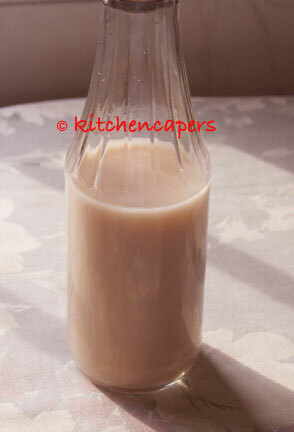 Farvested my brown rice wine!!! I just harvested my brown rice wine. It's very clear. Looks like the jasmine rice wine. However, the wine taste very sour. More like vinegar than wine. It's like the rice wine vinegar. Btw, what is the brown rice called in Mandarin? I suspect my brown rice is not the same as yours. Yours has a reddish/brown tinge while mine is yellowish/brown.